Stamps and Stitches: It's a Birthday Blog Hop-with prizes!! Great use of the LD frogs and kisses! Great Stuff! I am going to have to look into this Lettering Delights! I am now a follower as well. Such bright and cute projects! 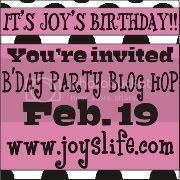 Enjoying the blog hop for Joy's birthday! Thanks for doing this! I love your projects! Great Job! TFS! I now follow your blog! TFS! I love your beautiful items. The paper is so perfect! TFS your great ideas. I am now a follower! Love your color scheme. Nicely Done. Im a follower now. Just call me a blogger stalker LOL. Your projects turned out great. They are so nice and colorful. All these cupcakes are making me hungry!! Love what you did! Very cute! I am a follower now too! This is just so fun and wonderful looking! Looks like it came right out of one of those cardmaking magazines!!! Love all the bright colors - and it's just so cute. cool ideas.. TFS...great job on your first hop. I am a new follower. Wow, everything looks fabulous, those place cards are sooo cute!! that little frog is just so cute!! TFS! So cute..I love the frogs. Oh my goodness! I love your projects. I cant believe all the superb talent on this blog hop and am so grateful to have participated! I am a new follower because I love your work! Hi, Gale! Love your birthday projects! The color combination is fabulous (I love turquoise and red together!) Really cute frog too! Sorry to hear that you've been having problems with spam attacks. How dreadful! Just wanted to say that I'm a follower. I love your place cards. Those are fantastic. Thank you for sharing. Love the projects, love the colors you used. TFS. I am a new follower. TFS, and thanks for the chance to win. I love your treat bags! TFS! I became a follower. TFS! Love those lips on the frog!!! What a fun theme for a birthday! So glad to be in this hop with you! 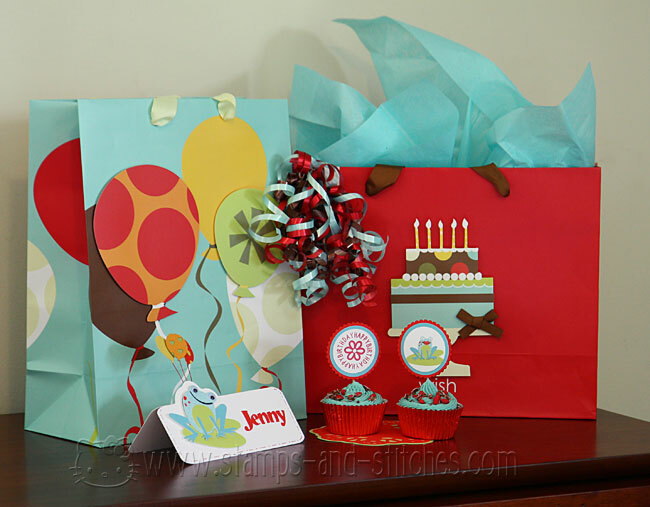 Very festive party favors, love your use of colors thanks for a chance to win. I also became a follower look forward to seeing you projects. 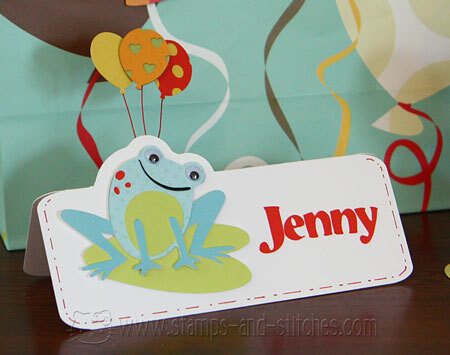 i love your frogplace card, how cute is that! I am a new follower. Please come visit me sometime! This whole ensemble is fantastic all the way around! The colors, images, EVERYTHING is SUPER CUTE!! All the birthday projects are cute! I like that Happy Birthday stamp in a circle. I'll have to get that! I love all of that! I can't wait until my warranty is up so I can hopefully get Make-the-Cut. Thank you. Wow..... so cute! Love all the colors you picked! I love how this project turned out - especially when you can customize in Photoshop. Will have to get some tutorials from you. Googly eyes are fun aren't they? I like how this project turned out. Googly eyes are fun aren't they? I just used this SVG and it is awesome. Nice b-day bags! Fabulous projects. LOVE the colors they're so fun. Gale, Your bags are great! I love your adorable place holder and cupcake picks. Thank you for being part of my b'day party blog hop! How adorable!! I just love all the colors. You did an awesome job!! LOVE your frogs!!! You do amazing work!!! Love your project!! Turned out really cute. 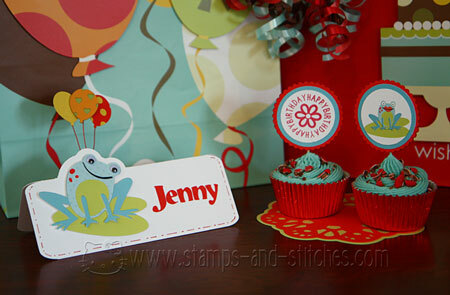 The froggy is adorable and the cupcakes look super yummy!!! Great Job!! Your projects are soooo cute!!! Love your designs. I also love your cupcake toppers and the colors you chose. I will definately be using this idea. Thanks for sharing. I also became a new follower.. I look forward to seeing your future designs. Those bags are so cute & I love the frogs my fave! wow! your work blows me away! your colr choices rock!!! Those are so cute! I love Lettering Delights! I love the cupcake toppers!!! This is just adorable! Gorgeous colors. loved your project!such a great idea! Great projects! I love the cute little frog! What cute projects! I LOVE the color scheme. Great projects! The frogs are sooo cute! And I like that the frosting matches the color scheme so well! I am now a new follower. Thank you for sharing your cute ideas. 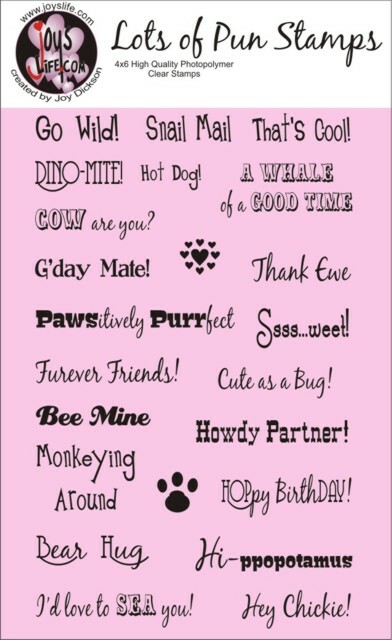 Super cute name tags and toppers! Thanks for sharing! I love your blog header. AAll of your work is cheerful and bright. I grew up in England where we had smarties. Does the cap have a letter on the inside. Oh goodness this is so super sweet! LOVE it. Love the name tag and cupcake picks! Stinking cute! I have never thought to change the colors on the LD SVGs! Too cute. I love what you did with the Frogs and Kisses SVGs. Really cute stuff! I am a new follower, too! I really like your blog! Cute projects. thank you for sharing. I am a new follower also. Awesome projects. I love the place card. Everything is fab!! Great projects. Love the frogs. Thanks for sharing. I'm now a follower! Thanks again for the chance to win those awesome stamps! I love this color story! Very beautiful! I think what you made is amazing! I wish I knew how to use MTC like you do! I am just blown away at how adorable the frogs are! I became a follower also! I love frogs! Love the googly eyes too! I love how your cupcakes are color coordinated also! Love the colors of this project ...so cute !....You also have a new follower ..can't wait to see your next projects ! I'm a new follower. Fun party decorations! That came out amazing!! So beautiful!! Love those colors!! BTW I am so jealous of your fabric collection :) Amazing!! So cute! I love the frogs & color combo. Oh, I became a follower, too! 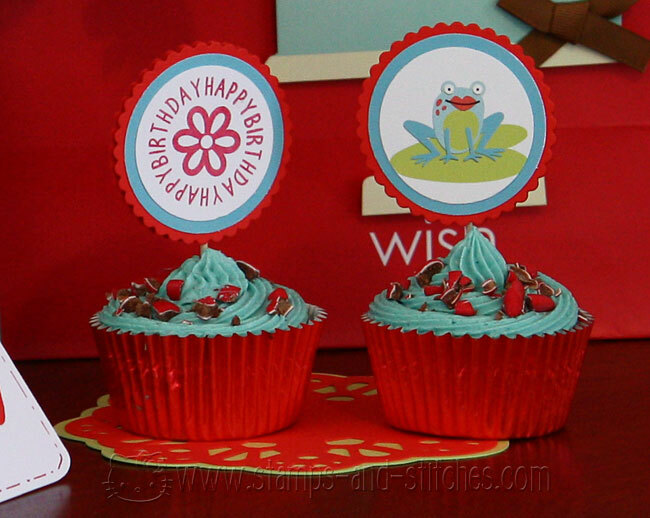 Love the frogs, and the cupcakes look delicious! Great party decor. TFS and thanks for the chances to win this stamp set. Oh how cute!!! Just wonderful!!! I love the colors and the frogs. I love these projects having a great time hopping. Target bags are great you can do so much with them!! Newest follower here! Can't wait to see more inspiration!!! Great projects! I love the colors and froggies! Thanks so much! Here's another comment now that I am a follower, on your projects: BEAUTIFUL!! I love how colorful they are. I love all your party goodies. Cupcake toppers are adorable. I am a follower now. I'm also a fishie friend. I'm following you now to see the rest of your fabric stash lol AND to learn more about MTC, and to see your great projects. I am a new follower and I really like your projects. That is just beautiful!!!! Thanks for sharing with us. I found you through the bloghop. these look so professional! wow! Love your projects and I just became one of your newest followers. Cute party goods! I just love Joy and all her fellow hoppers are full of great ideas and wonderful inspiration! The tulle was a great touch. Ooops, forgot to mention I'm a follower! WOW, all your projects are sooo cute!!! The cupcakes look really yummy too!!! I absolutely became a follower, your creations are awesome!!! Oh how I love the colors you chose! I love the frogs and kisses set too. I would love to know how you made the place card, it looks great! Just to let you know I'm happy to follow you! I love the set you made just so festive. I am interested to know how you convert other files to cut files? AMAZING projects! Wow...that is all I can say! You are so good with the Cricut! I love your project, so cute! I have the LD Frogs and Kisses set and I haven't used it yet but this is so cute I will have to give it a try! Also, I'm a new follower! Great looking bags and project! Love these sets from Lettering Delights. I really need to learn how to use MTC...it looks like a lot of fun! Really cute set, love the froggy place markers. I have never tried changing the colours in photoshop so thanks for that idea. Thanks for the chance to win. I love your ideas and the color combinations are great! Great projects! The frogs are adorable and I love the colors! What a fun birthday set! I love how you took something that you felt was more Valentine's themed and made it into what you wanted. I love the googly eyes on the frog. I keep a little jar of those around for some of my animal stamps. They really add that little extra something. I am a follower now as well. :) Not sure why I hadn't clicked on it sooner. Oh my Gosh, this is sooo cute, i love that frog....TFS!!!! What a great idea to decorate bags!! super cute project....thanks for the chance to win. Also wanted to say that I became a follower!! !